This PDF 1.5 document has been generated by / Skia/PDF m59, and has been sent on pdf-archive.com on 22/03/2017 at 07:14, from IP address 216.221.x.x. The current document download page has been viewed 232 times. File size: 130 KB (11 pages). 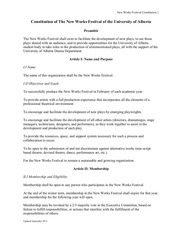 within the framework of a working theatre company. workshops, theatre road trips, and social events. 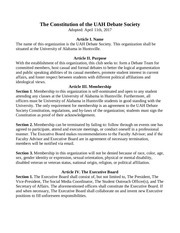 immediately presented to the AMS for approval, through the commission of internal affairs. Team, cast, crew or orchestra. 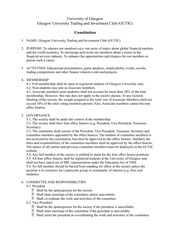 fees in full to the Vice-President/Treasurer of the Club or their designated representative. position. 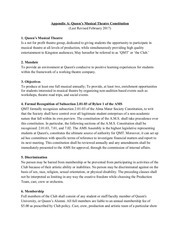 Club Volunteers assume all risk and liability in participating in QMT activities. unless a situation requiring a tiebreaker vote arises, in which case they shall cast a deciding vote. 11. Rules of Policy and Procedure). provided by the Board for club members. those ties shall be elected. before the conclusion of the academic year. Constitution on the club website at all times. it means only that the designated Board​ ​officer must ensure that the area is attended to. authority and responsibilities to the Vice-President/Secretary. 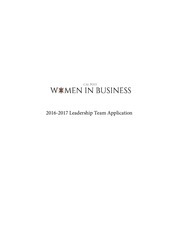 team members to an extent that is mutually conducive. within seven days of any request by any two Board Members. their original status if the decision is overturned. 13.1 Selection of the Director. 13.2 Selection of the Producer. decision will be put to a vote. Head of Sponsorship, Costume Designer, and Videographer. this responsibility to the Director and/or Producer at a time the Board deems appropriate. replacement of the Producer or other members of the Directorial Team. 13.8 It is the responsibility of the Production Team to coordinate the selection of Cast. applicants before accepting a position, and may be offered as a range rather than a discrete value. be noted during the candidate’s interview/audition. hiring must occur within two weeks of the original deadline. that of the Director’s, but with the input and consideration of the Producer. one week between the pitch and the decision. preparing it, for allocation of rehearsal time, and for working with the cast. deemed closed by the Vice-President Treasurer. budgets to ensure financial efficiency. Director is responsible for scheduling vocal rehearsals. deemed necessary by the Director or Producer. safety and security of the Production. of space and accounting for payment of said space. This file has been shared by a user of PDF Archive. Document ID: 00572529.